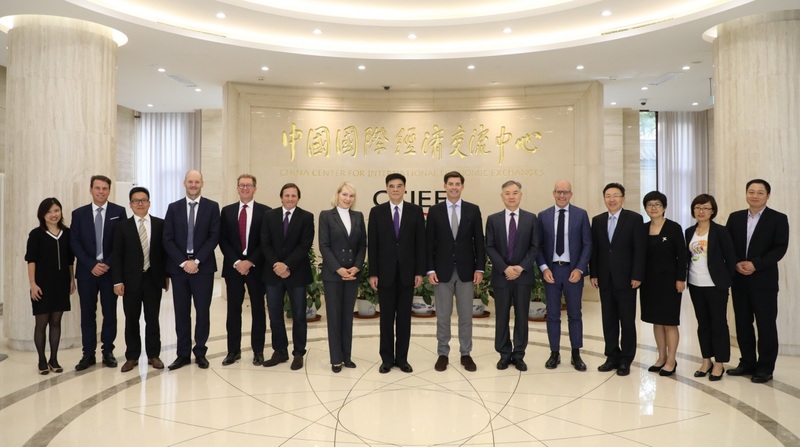 On September 4, Zhang Xiaoqiang, Executive Vice Chairman of CCIEE met with Ms. Margaret, Louis-Dreyfus, Chairperson of the Louis Dreyfus Group, and Mr. Gonzalo Ramírez Martiarena, CEO of the Louis Dreyfus Group. Xu Hongcai, CCIEE Deputy Chief Economist and Xu Chaoyou, Director-General of the Department of External Affairs of CCIEE also attended the meeting. Zhang Xiaoqiang introduced China’s supply-side structural reform and the rural revitalization strategy, pointing out that the 19th National Congress of the CPC proposed to build a modern economic system, promote economic development through innovation, and improve the quality of the supply-side. The rural revitalization strategy is very important and covers the rural land system, modern agricultural system, integration of the primary, secondary and tertiary industries, as well as food security. China has issued the “Guiding Opinions” and “2018-2022 Planning” to ensure a successful implementation of the rural revitalization strategy since the beginning of this year. Recently, China has announced a series of new initiatives to expand its opening-up, promote international cooperation and actively use international resources. In particular, the “Belt and Road Initiative” has been put into practice since it was initiated five years ago, and great results have been achieved in some countries and projects. The two sides exchanged their views on China’s agricultural supply-side reform, deepening reform and opening up, new changes in China’s agricultural products market, new opportunities for Louis Dreyfus in the Chinese market, and the trend of the China-US economic and trade relations and its impact on international trade. Ms. Louis-Dreyfus said that the exchange was very fruitful and hopes to strengthen cooperation with CCIEE.